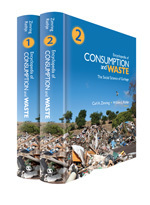 Back in April, I mentioned that the Encyclopedia of Consumption and Waste: The Social Science of Garbage was available. At the time, I had four copies of the hardcopy version on my dining room table. It is gratifying to, after months of work editing and revising entries, have a tangible, heavy object (more precisely, two tangible, heavy objects) as proof of your efforts. The vast majority of readers may not care about that sweat equity, however, and may not wish to risk hernias to look up issues relating to sewage, climate change, recycling, nuclear power, or, well, the waste generated by publishing books and periodicals. For a more than 1200-page, two-volume reference work, this electronic option is handy. It also gives you the option of printing or saving to PDF individual entries. Reading this version more closely approximates my experience of editing the work, as initial entries were submitted on Microsoft Word documents via a searchable database. This version has the advantages of polished entries, dozens of supplementary photographs, and easy-to-use links both within the entries and in the sidebar Subject Guide. If your library or lending institution is interested in stocking this title, direct them to the publisher’s contact information to get the process started. 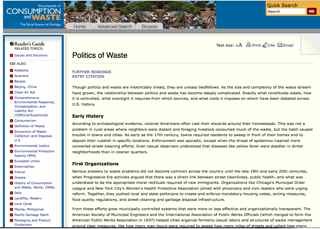 This entry was posted in consumption, Encyclopedia of Consumption and Waste, publications, waste on July 25, 2012 by Carl Zimring. Summer is migratory season for academics. Two, Alexandra Filindra and Steven H. Corey, just migrated to Chicago where she is teaching political science at UIC and he is the new chair of the Department of Humanities, History, and Social Sciences at Columbia College. Steve also studies urban environmental history, with an emphasis on waste management. He was, for example, research curator of the “Garbage! The History and Politics of Trash in New York City” exhibition at the New York Public Library and is co-editor of the American Urban Reader: History and Theory which incorporates environmental analysis extensively in its survey of American cities. Alexandra and Steve moved from New Jersey and Rhode Island (respectively) with their possessions transported in dozens of boxes. Now that they have unpacked, they have kindly given us many of those boxes. (A much-appreciated gift, as over the years, we have donated our old moving boxes to friends in need.) What will we do with these boxes? Cart our possessions…right back to the Northeast. Boxes between their jobs as storage. Storage awaiting transportation back East. Those of us interested in minimizing waste often talk about trying to close loops of material flows in order to avoid tossing wasted material into landfills, waterways, or vulnerable communities. We consider public policy to encourage or require the design and use of objects to minimize waste, producers developing voluntary manufacturing standards to close loops, or (as in my first book) discuss how informal markets develop to reclaim wasted material from open loop disposal practices. In this instance, the notion of a loop not only is about extending the working lives of the materials beyond one use but also has a spatial meaning. The boxes will complete an almost-perfect geographical loop between the New York and Chicago metro areas, allowing Steve and I to claim the repurposing of these boxes as a modest application of our work on waste. Alternately, it is possible that the process of packing is making me loopy. That would certainly explain the existence of this post. This entry was posted in recycling on July 20, 2012 by Carl Zimring. Karl Hendricks is a singer and guitarist from Pittsburgh. 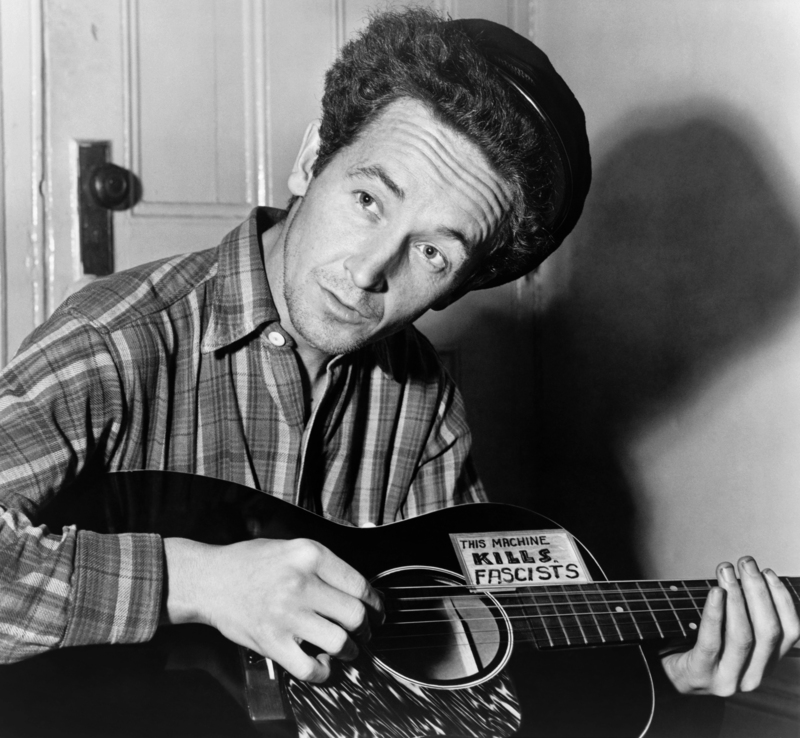 He is most known for a string of records he released in the 1990s, combining heavy Les Paul riffing with some of the smartest, funniest, and saddest lyrics in rock. (Both tendencies are evident on the early single “Baseball Cards” and 1996’s “A Boy Who Plays with Dolls.”) The Karl Hendricks Trio (featuring Karl with a shifting combination of bassists and drummers, occasionally with a second guitarist to transform the Trio into the Karl Hendricks Rock Band) played shows with Silkworm and released albums on Superchunk’s label Merge. While those bands informed Karl’s music, judging his records by their covers — illustrated by the likes of Chris Ware and Wayno — gives more of a clue to Karl’s precise, bleak, and witty sensibility. The onetime steel-making capital of the world had become a great place for a graduate student to live. Rooms went for around $200 per month. One year, I paid that much to share a house on the Point Breeze block that was recreated in miniature for Mr. Rogers’ Neighborhood. Fred Rogers had moved to the Oakland neighborhood by that time, and it was not unusual to see the gracious, famous man on the street near the WQED studios. You could eat cheaply in Pittsburgh, especially if you liked Indian food. Sree’s Foods sold $3 styrofoam boxes filled with chick peas, rice, and potatoes out of the back of a van parked on campus. Sree’s was something of an employment agency for the local music community. Sometimes the van was staffed by Karl’s wife Megan, or his onetime bassist Caulen, or his future drummer Jake. 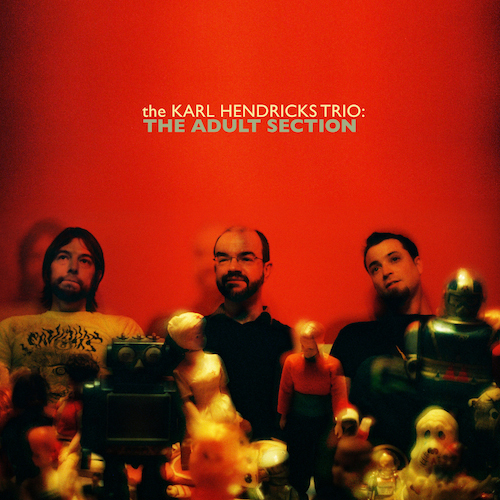 The Karl Hendricks Trio would play in a cramped tavern, and you might turn around and see Mr. Sree enjoying the show from the comfort of the bar. Each new Karl Hendricks Trio record was met with rapt enthusiasm at the campus radio station, making his music an important part of the community of young people living in an old city. This month, Karl releases his first new album in five years. The Adult Section continues his lyrical and musical approaches with nine songs about uncomfortable situations, alcohol consumption, and the emotional minefields of memories as time passes. It joins 2003’s The Jerks Win Again and The World Says as examples of how to produce thoughtful, muscular rock. The Adult Section is not a rehash of what Karl Hendricks was doing at 25, but it is no softer or quieter than Some Girls Like Cigarettes or A Gesture of Kindness. Instead, The Adult Section is simply music that reflects a man taking stock of his life and his surroundings at middle age. Why do I hold on to all this trash? The litany of objects the narrator of “Dreams, Ha” rattles off include mass-produced baubles of plastic and cardboard, commodities (even broken ones) that the narrator’s memory intertwines with intimately individual leavings of teeth and hair to produce deeply personal meanings. If the future turns out not to be just one long present, with relationships slipping away due to tragedy or circumstance, how tempting is it to clutch totems of good times past? Two decades after lamenting a time when all your best ideas have been bought and sold, Karl presents a narrator more worried about hanging on than selling out. “Dreams, Ha” has both professional and personal significance to me because it raises ideas about consumption and waste. Karl Hendricks neatly articulates how an individual gives meaning to (or, as Walter Benjamin put it, fetishizes) objects designed, mass-produced, distributed, and sold by people with no personal connection to the consumer. That meaning goes well beyond the money paid for those objects, as the narrator makes the effort to preserve and protect these things over time even if they have no ostensible function or value to anyone else. The Adult Section arrives as I decide whether to pack or trash the clothes, books, records, baseball cards, furniture, photographs, letters, and other possessions I have collected through several moves over the years. This move is more of a challenge as I go from a house to a smaller, furnished apartment. My desire to keep my stuff is tempered by reluctance to pay to store it somewhere in the most expensive city in the United States. Urgency to curb my packrat tendencies is greater than ever. (It is possible that editing several encyclopedia entries on hoarding and acquisition since my last move help my resolve almost as much as the finite space that waits for me in Brooklyn.) Over and over this summer, I have sorted through my closets and boxes asking myself, why do I hold on to all this trash? Some of the things I have carted around the continent over the past quarter century are finally exiting my life via garage sales, Craigslist, Freecycle, the recycling bin, and the dumpster. I am not getting rid of everything. Much will make the drive to New York, a drive that will involve a stopover for a few days in Pittsburgh. I will double back on my past, to a town that has changed since 1994. The Pirates are threatening to win more games than they lose. Lawrenceville’s dilapidated homes and storefronts have seen a renaissance (a word often used by local boosters) with artists’ enclaves popping up on Butler Street. Paul’s CDs closed a few months ago, and Karl now runs Sound Cat Records in its place. Lou Gehrig’s disease killed Mr. Sree last summer. Cancer took Mr. Rogers weeks before I left town nine years ago. Most of the soot on the buildings has been scrubbed away. The Adult Section is available on vinyl LP that comes with a compact disc “for the sake of your convenience.” Shelf space awaits both the LP and CD in my new apartment. This entry was posted in consumption, history, waste on July 9, 2012 by Carl Zimring. Kevin Whiteacre, Director of the Community Research Center and Assistant Professor of Criminal Justice and Sociology at the University of Indianapolis, runs a website called MetalTheft.Net that “aims to identify and provide high quality, scholarly, professional, and publicly available literature on metal theft” through articles and interviews. Recently, he interviewed me on the history of metal theft, and our conversation is now available online. 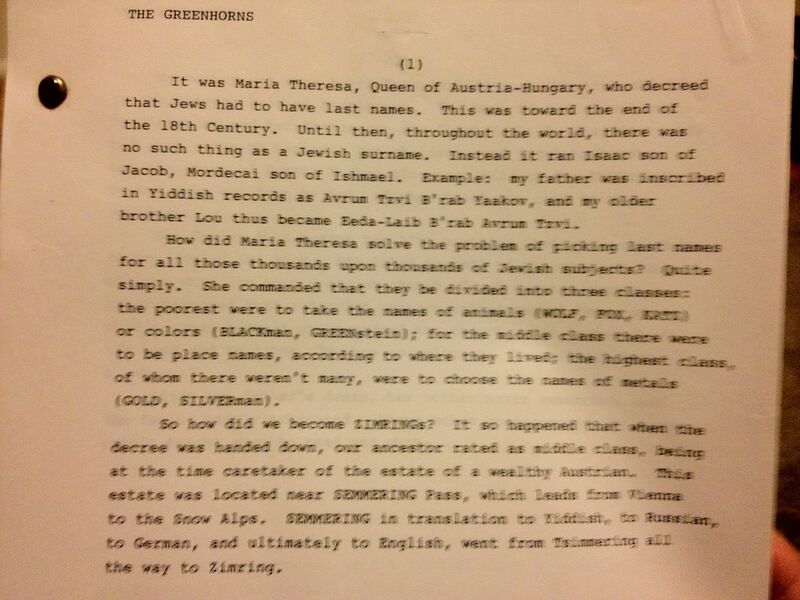 This entry was posted in interviews, publications, recycling on July 2, 2012 by Carl Zimring.